This page is for the Java Edition. For the Windows 10 version, see Minecraft: Windows 10 Edition. Active and dedicated modding scene, responsible for many fixes, tools and additional content. Game follows the Software as a Service model and support for previously supported platforms can easily be removed with the next version. Likely to perform worse than the Windows 10 Edition on low-end hardware. All versions require a Mojang Account or Minecraft Account. 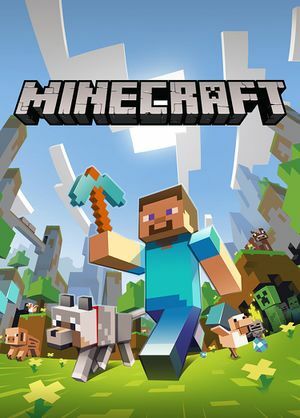 Purchase no longer includes access to Minecraft: Windows 10 Edition as of October 19, 2018. Magic Launcher - a custom launcher. It can configure some in-game options and includes a dedicated mod loader with compatibility checks. MultiMC - a custom open source launcher. 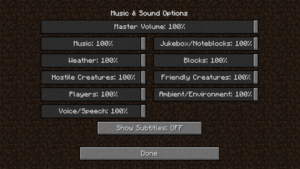 It allows you to have multiple, separate instances of Minecraft, each with their own mods, texture packs, saves, etc. Minecraft Forge is required by most mods, and is the standard for a modded setup. 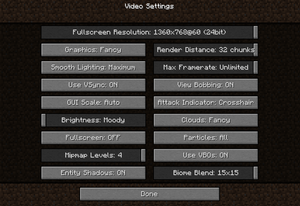 OptiFine adds support for HD textures and a lot of options for better looks and performance. As of 12/17/2015, Optifine now also supports shaderpacks. The Windows version of Minecraft includes Java (used for Minecraft only). Installing Java manually is not necessary. Minecraft benefits from using the latest version of Java. Using 64-bit Java on 64-bit operating systems is strongly recommended. The official launcher allows you to easily allocate RAM and set other Java arguments. The manual methods are detailed below. Right-click on Minecraft.app in Finder and choose Show Package Contents. Go to Contents and open info.plist using TextEdit. Modify -Xms ### MB - replace ### with the minimum amount of memory Minecraft can use (in megabytes). Modify -Xmx $$$ MB - replace $$$ with the maximum amount of memory Minecraft can use (in megabytes). Go to the location of Minecraft.jar. Replace ### with the minimum amount of memory Minecraft can use (in megabytes). Replace $$$ with the maximum amount of memory Minecraft can use (in megabytes). Making the Minecraft install portable allows putting the game files on the drive of your choosing, e.g. storing them on an SSD for faster loading, as well as easily using it across multiple computers. This method is only available on Windows. Make a folder where you want to store Minecraft game data. Move the .minecraft folder from %APPDATA% to the folder you made. Download the latest Minecraft version and save it into the folder you made. Choose File>Save and choose the folder you made in step 1. Save the file as Minecraft.bat (or similar). You can now launch Minecraft from Minecraft.bat and everything will be saved in the folder you made. This folder is fully portable so you can move it wherever you like and even put it on external storage to use it on other computers as long as they have Java installed (see Java version). You can make a shortcut to Minecraft.bat on the desktop and so forth to launch it more conveniently. launcher_profiles.json contains stored user profiles. The server save is stored in world in the root directory of the server. Saves are not compatible with Minecraft: Windows 10 Edition. Can be stretched to any window size. 30-110°. See Field of view (FOV). Set in options or toggle with F11. Use Borderless Gaming with regex: Minecraft (\d+\.\d+\.\d+|\d+w\d+\w). Use OptiFine to disable the dynamic FOV feature. Find fov and modify its value. 1.0 = 110° FOV, 1.25 = 120°, 1.5 = 130°, 1.75 = 140°, 2.0 = 150°. Only usable in the inventory screen. Minecraft: Windows 10 Edition has full support. Use Joypad Mod. Minecraft: Windows 10 Edition has native support. Use Vivecraft or Minecrift Vive. 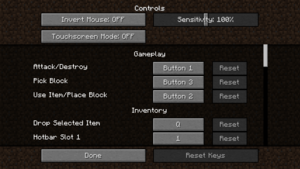 Minecraft uses a Windows function to control mouse movement, which can be modified. 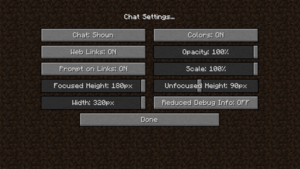 Modifying the function affects any software that relies on it (not just Minecraft). Download the MarkC Mouse Acceleration Fix. Extract its contents to a new folder. Open the Start menu and open the Control panel. Select Display from the list. Check your PC's text size (100%, 125%, 150%) in the display settings. Open the folder you created in step 1. Open the sub-folder that fits your operating system. Double-click the .reg file that corresponds with your text display percentage. Confirm the changes to registry. No spoken dialog in game. Subtitles do show sounds. Most sounds have their own individual subtitles. Automatically pauses on focus lost, except in multiplayer. A few joke "languages" are available as well, such as Pirate Speak, Shakespearean English, Klingon etc. Requires a Mojang Account or Minecraft Account. Multiplayer is not compatible with Minecraft: Windows 10 Edition. 2147483647 Usable with the Joypad mod. Max players is capped to the max integer size in Java. 2147483647 Max players is capped to the max integer size in Java. See Helix Mod: Minecraft 1.7.10 in 3D Vision. Can also use Vivecraft or Minecrift. Mojang has created an Official Bug Tracker that you can use to find or report bugs. Please search for your problem before reporting it, as it may have already been fixed for the next update or reported previously. Reporting bugs multiple times does NOT help the developer fix them faster. Some problems can be solved by simply restarting the client. Check the status of Minecraft services. If all servers are online, continue reading the instructions. Add Minecraft as an exception to any firewall software you use (including Windows Firewall). For OS X and Linux uninstall all versions of Java on your computer and install the latest version. Restart your computer. Uninstall any mods and texture packs that are incompatible (or of questionable compatibility) to the version of Minecraft you are using. Some crashes are caused by the game's rendering distance. Try setting it to 8 chunks or lower. Make sure you have the latest version of Java in its 64-bit variant. This fix does not apply to the latest Windows version of Minecraft. Install the latest driver for your graphics card (Intel drivers, Nvidia drivers, AMD drivers). If you're using a Toshiba laptop with an Intel GPU, uninstall any AMD/ATI driver. Feed The Beast (or FTB) is a massive mod pack, combining the more popular Minecraft mods into a complete and easy to use package. All the mods included use the Minecraft Forge API. Multiple variations of FTB are available to suit different playstyles and needs. Full details and download links can be found on the official website. 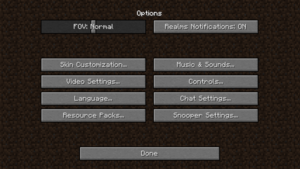 ↑ 3.0 3.1 Mojang | Do I log in with my email or username?